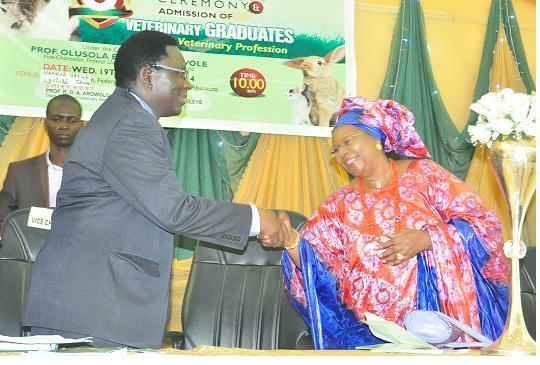 The President of the Veterinary Council of Nigeria (VCN), Professor Garba Sharubutu has charged newly-inducted Veterinary doctors to see their induction as a call to greater service, professionalism and unalloyed commitment to the practice of Veterinary Medicine. The VCN President gave this charge at the Sixth Induction and Swearing-in Ceremony of graduates of the College of Veterinary Medicine. 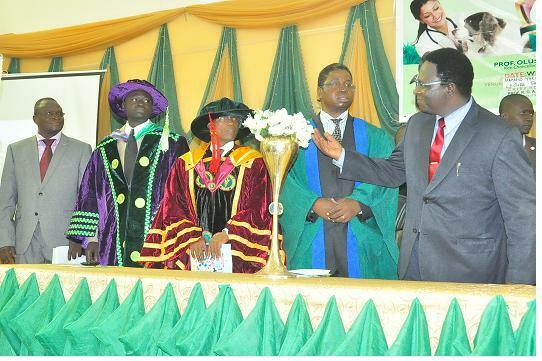 Professor Sharubutu, who was represented at the occasion by his Vice-President, Dr. Allswell Emejuru, said that by virtue of the induction oath, the new doctors had accepted “to give unalloyed loyalty to the practice of the profession with diligence and precision in line with best practices”. Commending the University for its commitment to applying best practices in all its dealings, the President said the law establishing the Veterinary Council of Nigeria provided that only graduates from recognized Veterinary schools, who satisfied the training conditions of the Council were qualified to be registered to practice Veterinary Medicine in Nigeria, adding that “the swearing-in of the graduates today is subsequent to the positive report received from the VCN Examinations Observation Sub-committee, which visited the Institution and observed its examination”. He admonished the new doctors to be good ambassadors and strive to constantly update their knowledge, stressing that the Veterinary profession is a highly respected profession the world over. 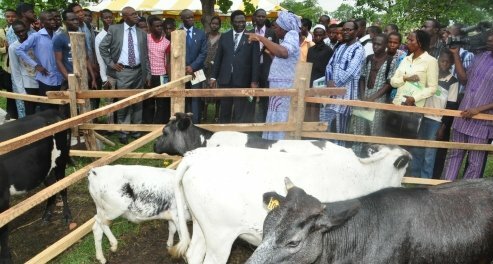 Professor Sharubutu pointed out that professional activities, which would be expected of them include carrying out diagnosis and performing laboratory test on sick animals, treatment of diseased animals including the performance of surgical operations, advising the owners of the sick animals based on diagnosis and prevention of disease outbreak, among others. The Chairman, Nigerian Veterinary Medical Association (NVMA), Professor Oyewale Tomori, who was represented by Dr. Kunle Abiade, Chief Executive Officer (CEO) of Petcare Nigeria Ltd, welcomed the new doctors into the Association and promised that their rights would not be infringed upon and would be entitled to the services of an employment bureau within its Secretariat, where employers and potential employees are linked together. The Dean, College of Veterinary Medicine (COLVET), Professor Reuben Arowolo, lauded the contributions of the University Management and other stakeholders to the development of Veterinary Medicine in FUNAAB saying that the College was proud to have moved from the old Veterinary Teaching Hospital, situated at Isale Igbehin to a magnificent edifice on campus; “the newly-completed Veterinary Teaching Hospital of FUNAAB, which is about the largest in Nigeria”, he added. Professor Arowolo said the College had produced 136 Veterinary Doctors of six sets for the country, as he appreciated both the National Universities Commission and the Veterinary Council of Nigeria for their contributions to the College. The Dean also appreciated the immense contributions of Senator (Dr.) Iyabo Obasanjo-Bello, Dr. Musa Alasa of Adamore Nigeria Limited who were conferred with awards of excellence. While appreciating COLVET, on behalf of other awardees, Dr Alasa, an alumnus of the prestigious Harvard Business School, United States of America and recipient of several Veterinary awards, enjoined the new graduates to have a clear focus on what they intend to achieve in life and to always remember their parents, teachers and all those that had played active roles in their journey to success. In his Keynote Address, the Vice-Chancellor, Professor Olusola Oyewole, disclosed that the University was committed to improving on the training facilities in the College, in order to maintain the high standards the University is known for by producing sound Veterinary doctors. He charged the graduating students to become great leaders for the country. He also stressed the importance of role modeling and mentoring in the life of young people. He congratulated the awardees at the occasion and appreciated them for their contributions and investment in the College. 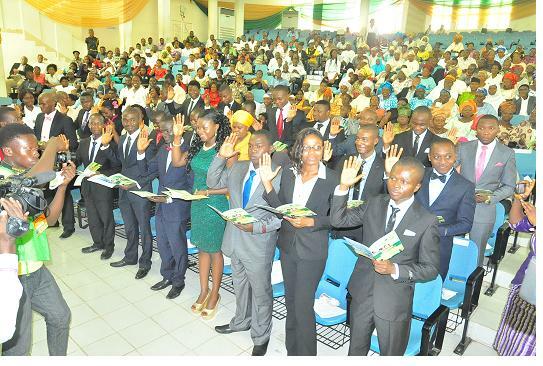 High point of the event was the administration of the oath by the VCN Registrar, who was represented by the Deputy Registrar, Dr Josiah Kantiyo; donation by friends of the College and FUNAAB; and presentation of certificates to the newly-inducted doctors. Dignitaries present at the occasion included Chief (Mrs) Oluremi Obasanjo, wife of the former President Olusegun Obasanjo; Dr Enitan Obasanjo-Adeleye, younger sister to one of the awardees, Dr Iyabo Obasanjo-Bello, former Chairman, Senate Committee on Health; Rev Dr Wilson Badejo, former General Overseer, Foursquare Gospel Church; and Dr Dotun Sorunke, Director of Veterinary Services, Ogun State and President, Nigerian Veterinary Medical Association, Ogun State. «Department of Foodservice and Tourism gets full Accrediation and a New Name!